The College of Shari`ah and Islamic Studies, represented by the Vice Deanship of the College for Educational Affairs and Development and the Vice Deanship of the College for Training and Community Service, held a "Thinking Skills" Competition to contribute to developing and motivating the ability of talented students to think, reason, and analyze to solve problems. 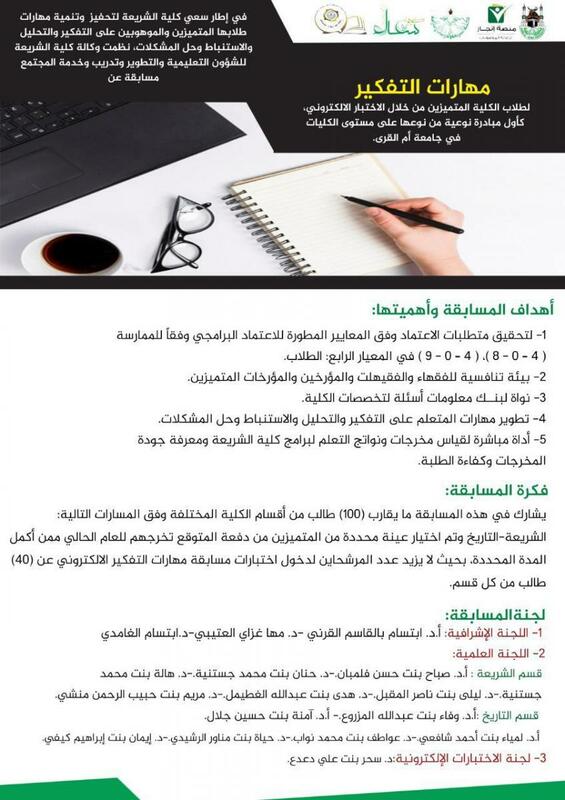 The competition is aimed at achieving a competitive environment for outstanding male and female jurists and historians and realizing the Academic Institutional Accreditation, which is a direct tool for measuring learning outcomes and outputs and identifying the quality of the outputs and the efficiency of the students. A number of female staff members participated in the competition committees designed to assess the participants.